Science answers ultimate question! Which came first, chicken or egg? British scientists claim to have solved one of the great mysteries of life, the universe, and everything in it: The chicken came before the egg, they say, and they're not mincing words. 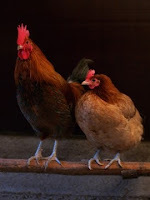 "It had long been suspected that the egg came first, but now we have the scientific proof that shows that in fact the chicken came first," Sheffield University's Colin Freeman, according to a report in the Metro. Researchers from Scotland and England used a supercomputer called HECToR to look in such detail at a chicken eggshell that they were able to determine the vital role of a protein used to kick-start the egg's formation.